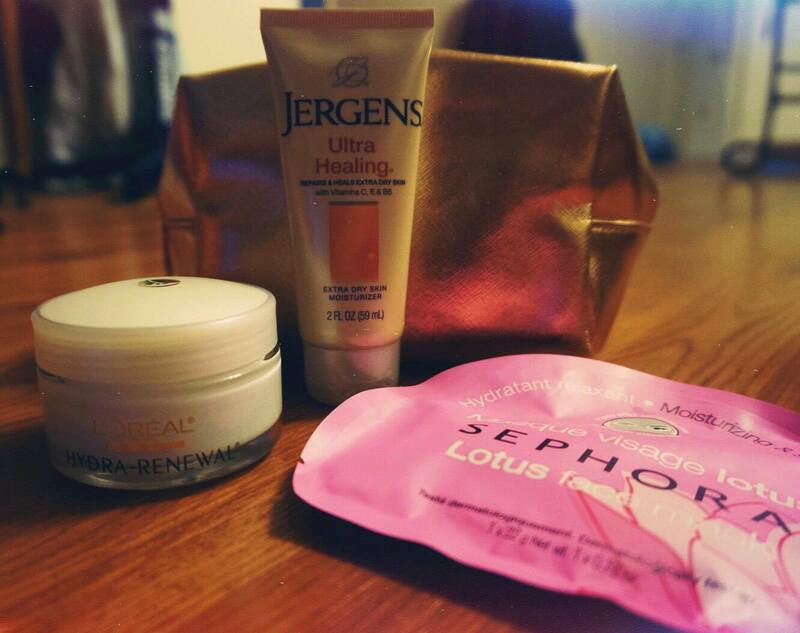 From left to right: L’Oreal Hydra-Renewal Cream, Jergens Ultra Healing Extra Dry Skin Moisturizer, Sephora Lotus Face Mask. Traveling can be super exciting, but also long and tedious especially when traveling cross country or overseas. Lengthy travel in high altitudes can cause our skin to become dry, flaky and extremely dehydrated. To combat this, I use four items that are vital for me to get rid of that stale, flaky feeling and enjoy moisturized skin even 30,000 feet above the ground. This should be a no-brainer. Water is necessary to keep your skin moisturized from the inside out. By drinking some good ole H20, you can significantly increase your skin’s elasticity and reduce dullness. Since you cannot take water through airport security, I would suggest bringing a water bottle to fill up or buying a large one before boarding. When you have some time to kill in flight, why not pamper yourself? I thoroughly enjoy using face masks especially when I know the promise of supple skin is coming. Sephora offers mutiple facial peel off mask options for a better complexion. My favorites, though, are the lotus and rose masks. The lotus mask promises to reduce signs of strain and fatigue and it definitely does. It also keeps your skin perfectly hydrated. Ok, this cream is heaven in a bottle. First off, this face lotion is only 6 dollars at Walmart, so it’s a steal. Honestly, this is one of my favorite moisturizers. It’s not heavy and allows your skin to feel just the right amount of dewy. It’s extra hydrating as well with Pro-Vitamin B5, which protects against moisture loss. I used this on my trip to England and even though, I only slept three hours I didn’t look overly tired. We can’t forget the most delicate areas of our body. My arms and hands tend to get the most dry when on flight. For that, I use Jergens Ultra Healing Moisturizer. This lotion is so THICK. It really penetrates even the deepest levels of my skin and maintains that hydration without having to constantly reapply. I highly recommend this lotion to use for your entire body to relieve any issues you may have that is caused by dry skin. Areas like your heels, elbows, hands and feet will benefit the most. I hope this list helped all you beautiful people with becoming one step closer to hydrated skin in-flight. Let me know your thoughts in the comment section below. "What’s In My Travel Bag"